This post is the third in a new series by Higher Education Today, Beyond the Margins: Meeting the Needs of Underserved Students. For parents, receiving a college degree is one of the best investments they can make to improve the financial security, social mobility, and overall well-being of their family. Research has repeatedly shown, for example, that college graduates have higher lifetime earnings than their peers with just a high school diploma, and are more likely to report experiencing better health than those with lower educational attainment. Yet for the 4.8 million college students raising children, navigating higher education—a space primarily designed with young, non-parenting adults in mind—can be uniquely challenging. Today, more than a quarter of all undergraduate college students are raising children, and about 44 percent are doing so without the support of a partner. The majority of single parents in college—80 percent—are women. Women of color are particularly likely to be single parents while in college: Nearly 40 percent of Black women and more than a quarter of American Indian/Alaska Native women in higher education are raising a child without the support of a partner (in comparison to 19 percent of Hispanic women and 14 percent of white women). While the share of parents enrolled in college has been steadily growing—according to the most recent data, the proportion of students with dependent children has increased 30 percent from 2004-12—the share of parenting students who complete college remains low. The most recent data show that about half of all college students earn a degree or certificate within six years of enrolling, while only a third of student parents complete school, with the rate even lower for single parents (Figure 1). Though the reasons for leaving college without a degree vary, the heightened financial and time pressures faced by student parents can pose significant challenges to graduating. Compared with their non-parenting peers, student parents are nearly twice as likely to live in poverty, and are much less likely to have the resources to pay for college than their dependent peers. Compounding the financial pressure, student parents must also find affordable child care, which is often a significant expense. According to the Care Index, the average cost of center-based care in the United States—about $9,589 annually—is outpacing the average cost of in-state tuition at $9,410. Meanwhile, the share of campuses with childcare centers continues to decline, despite the growing need. As colleges work to improve attainment rates and address economic, racial/ethnic and gender inequality on their campuses, institutions should take steps to better understand and support their diverse student population, including students with families of their own. Ensuring that student data can be disaggregated by parental and marital status, for instance, can help administrators better understand the needs and experiences of students who are balancing school and parenting. Institutional leaders can work to protect funding for student parent supports, such as Pell Grants and the federal Child Care Access Means Parents in School (CCAMPIS) program, which is the only source of federal funding available to facilitate low-income college students’ access to child care. Connecting Student Parents with Financial Support and Education: The University of Wisconsin-Milwaukee’s Life Impact Program provides participating low-income student parents with a $5,000 renewable scholarship. Life Impact Scholars are also connected with a life coach who helps students navigate on- and off-campus resources, such as child care, transportation supports, and career development programs. At Norwalk Community College in Connecticut, parenting students can enroll in the Family Economic Security Program, which provides financial coaching, in addition to achievement coaching, peer support, and educational programs, to learners who have experienced interruptions in their college pursuit. Targeting Academic Support to Student Parents’ Needs: Endicott College’s Keys to Degrees program provides tailored tutoring to participating student parents until they can maintain a 3.0 GPA. Keys to Degrees staff also coach students on how to talk to professors about balancing school with family responsibilities, help them secure internships related to their degree and ensure their graduation within four years. At the University of California, San Diego, student parents can apply for priority enrollment so they can secure the courses they need to graduate while also creating a schedule that allows them to balance their school, family and work responsibilities more easily. Making Child Care Accessible and Affordable: At the University of Michigan, low-income student parents may access a child care subsidy through the school’s Financial Aid Office, which they can use for licensed child care in the community. Parenting students attending Lane Community College in Oregon are offered no-cost assistance finding child care through an on-campus child care resource and referral center. Building Peer Community: At the University of Alabama, the Undergraduate and Graduate Parent Support programs developed online forums so that student parents can connect on issues related to balancing schoolwork with family responsibilities. Student parents at the University of Minnesota-Twin Cities can attend group lunches for parenting students, coordinated by the university’s Student Parent HELP Center. Establishing a Family-Friendly Campus Environment: At Niagara County Community College in New York, the Mapping Opportunities for Moms program equips administrative and counseling offices with toys, signaling to students and college staff that families are welcome on campus, in addition to providing single mothers with a range of supports to help them attain a degree or certificate. The Family Resource Center at Los Angeles Valley Community College has created a space on campus for the college’s parenting students, where they host play groups, as well as baby clothes exchanges, book exchanges, in addition to other two-generation services for parents and their children. These are a few examples from a menu of options institutions may consider when developing family-friendly programming, and can be mixed, matched, and molded to fit the particular needs and capacity of institutions. While the approaches vary, what these supports have in common is the ability to help stabilize low-income student parents so they have both the time and economic security to focus on attaining a degree. 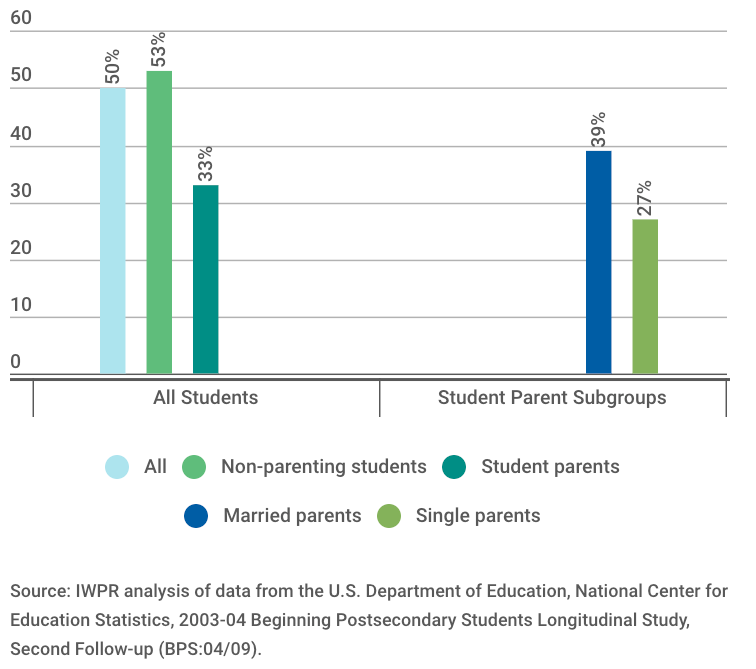 By advocating for student parent supports, developing a greater understanding of student parents’ needs and implementing targeted interventions, colleges can build a more welcoming, productive environment that helps parents complete school and launch careers that provide economic security for their families.